As I mentioned in the last post – Partnering With Global Medical Innovations And Freedom Belt™ – we have joined forces with Dr. Mario Torres-Leon and Dr. Justin Mandel. Advice from REAL doctors on how to make life with a catheter better for you and your loved ones! 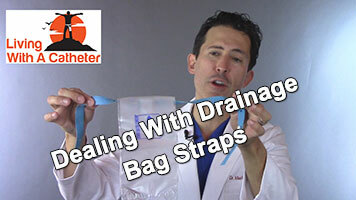 One of the most asked questions according to our survey is how to best secure your drainage bag. Dr. Mario put together the video to help answer that question. One big concern is with the traditional method of wrapping 2 the stretchy bands that come with most bags around your leg. If they’re too loose, the bag will slide down the leg as you move around, especially as the bag fills and becomes heavier. The only recourse to make that more secure is to tighten the straps. But there is a problem with making the straps too tight also. You can be in danger of cutting off or limiting circulation. Probably the best solution to this problem is to use a suspension system for your drainage bag. At the moment, there is only one product available that allows you to do that. It’s called Freedom Belt™. You can find out more about that, and get one for yourself here: https://freedombelt.com.